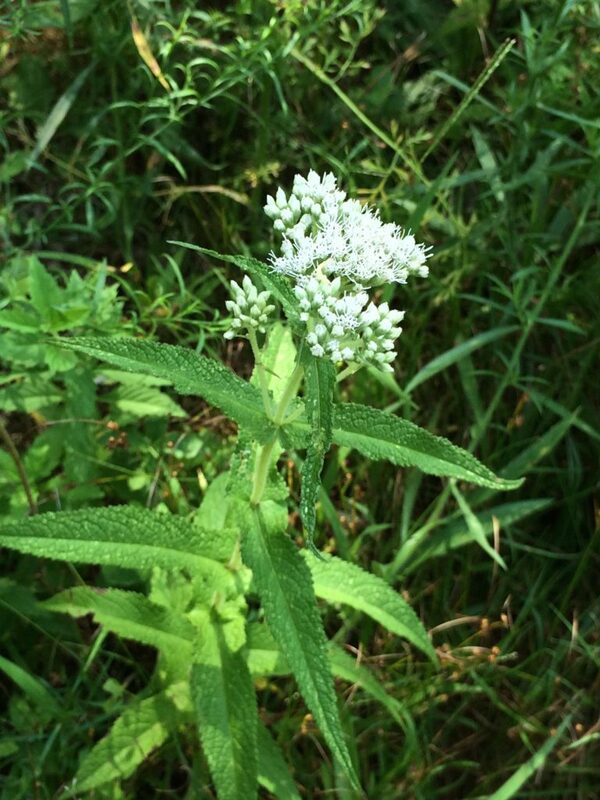 Eupatorium perfoliatum, boneset (Asteraceae). MBGargiullo.pond margin, Falmouth, MA, 8/2015, (Accessed 11/2018). Eupatorium perfoliatum is a perennial herb, 40-150 cm tall, most parts very hairy, pale, dull green. 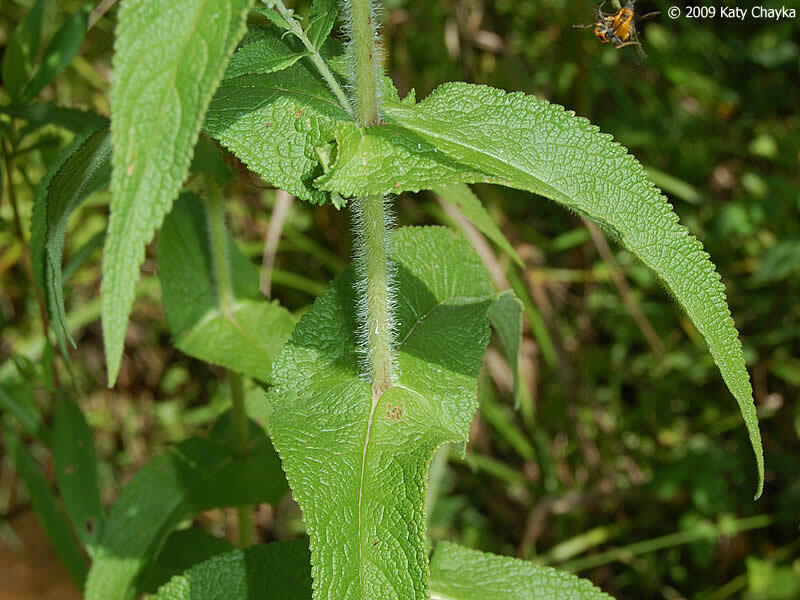 Leaves opposite, bases broadly fused across stem, 7-20 cm long, 1.5-4.5 cm wide, tip long-pointed, surface finely puckered, hairy below, widest at base, stem surrounded by leaf, margins toothed. Eupatorium perfoliatum flower heads. 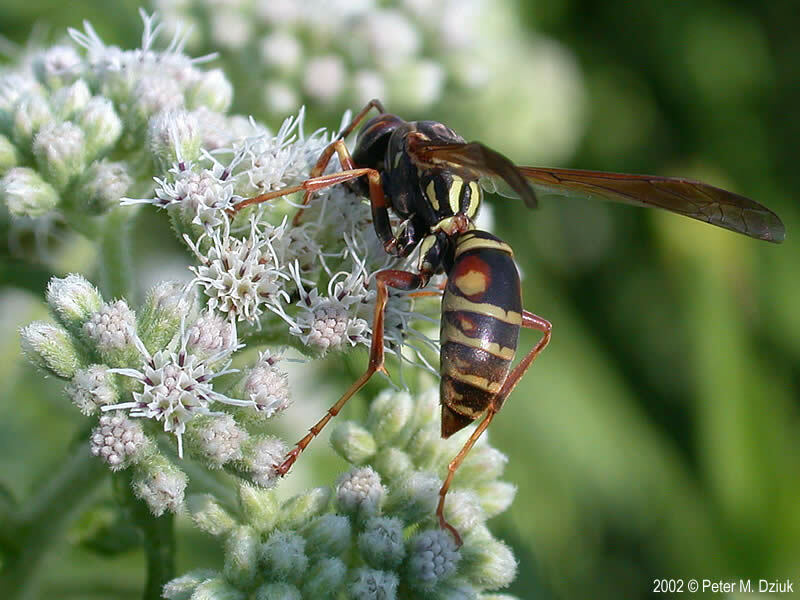 with wasp. 2002 © Peter M. Dziuk. Minnesota Wildflowers. minnesotawildflowers.info (Accessed 11/2018). Flowers dull white, 9-23 per head, bracteate base 0.4-0.6 cm tall, bracts in three rows, overlapping; inflorescence flat-topped. Fruit dry, 1-seeded, 5-angled plumed achene. Seeds eaten by some birds (Martin et al. 1951). Blooms July-Oct.
Habitat: Open wet areas, marsh edges, wet roadsides.